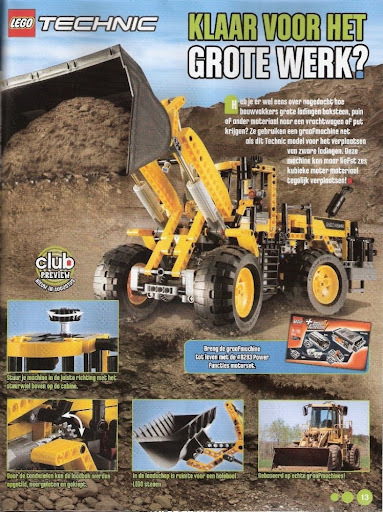 Ryan, raised my attention to a new image at BS, from a page in LEGO Club Magazine, which features the new TECHNIC Wheel Loader to release in some weeks (August) and its features. One new 5x7 Open Center TECHNIC frame in the front axle, where the latest differential also fits. Definitely 2+1 Linear Actuators to control the two bucket movements. Working motor with pistons on the backside. HoG steering on top of the cab. Expandable with 8293 Power Functions kit, to motorize your model. 'MK8265' on the stickers... Does it suggests you, who might have been the LEGO Designer of this set? Added another scan, provided by Martijn. 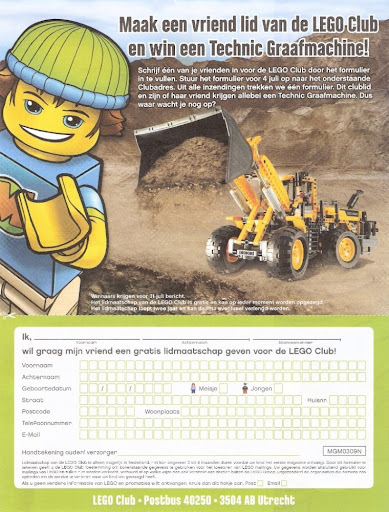 It is a form with which you can win a Wheel Loader if you bring a new member to the Club. Meanwhile also a top-down translation, for the text in the first image. "Ready for the big work? Did you ever wondered how workers handle big loads of bricks, dirt, or other materials into their trucks? They use a Wheel Loader just like this TECHNIC model, for replacing heavy loads. This machine can scoop up to 6 cubic meters at once! Steer your machine in the right direction with the steer wheel on top of the cabin. Bring your digger to live with the #8293 power functions motor set. The gears lift and tilt the scoop. Inside the scoop is a lot of room for all your LEGO Bricks. Based on the real machine." Do you know what is happening with the railing at the back. In the linked image I point out what I am talking about. It looks like it is not completely pushed together. I notice that sort of thing alot with these kinds of photos. Maybe the photographer has to build them him/her self haha. BTW new pictures have appeared on brickshelf of the 8258 and there has been a change! It now has the XL-MOTOR. YYYYEEEEEEEEEEYYYYYY! Haha I see. It seems like a good model. BTW. Thanks for the awesome blog. Oh I see. Thanx very much for posting these pics. Nice! Now, all it needs more is rear wheel drive (in addition to front wheel) to be the same in functionality as the 8459 Pneumatic Front-End Loader... and, if the designer (I wonder what "MK" stands for... ;)) went to the trouble of passing a drive axle through the steering articulation, linking it to the rear wheels should be a no-brainer. :) Although I personally wouldn't find it absolutely essential, pendular suspension on the rear axle would be a welcome and realistic addition. Now, I wonder if the B-model is a log loader! You think 8258 could have 2 differentials, just like 8868??? I wouldn't be suprised at all! He also designed the 8421 Mobile Crane and certainly others. I like this touch (like the license plate on the 8297 Of-Roader), it's kind of a signature without being too obvious or flashy. Guys looks where thse middle linear actuator is fixed to the showel. Its fixed with a 3L pin on an angular beam. As far as i know all current abgualr beams have fixed holes (+) on ends... New part maybe? It looks an angular beam in this image, but most likely it s not, if we compare with the other images from the box, seen before. Ryan, i'm also hoping it has two differentials like the 8868. However looking at some close-up pics (the one showing the white clutch gear and switch behind the red panel) it does not appear to have two. Might be wrong tho. still i'm getting very exited about this model now! 8^D. Still can't help but wonder, if LA's wern't intended to replace pneumatics, then why doesn't the wheel loader have them? (or any model since the LA's were introduced for that matter). Just seems to me that it would have been so much better and more realistic/life like with pneumatics. @Al & AVCampos: My theory is the 8265 helped bring back the airtank and there wouldnt have been a 9641 otherwise. Who knows when the final decision was made for the production version of 8265, but I remember we first heard a new Wheel Loader was coming and we dreamed in disbelief--studless 8459! what a perfect revival or new mold for a pneumatic airtank! Then the 9641 was leaked and it was confirmed, pneumatics are still alive, better yet the 8265 DID revive the airtank and its already being used in other sets! ...Rather then belabor the tragic comedy I'll get to my point: my totally unsubstantiated theory is that MK designed the 8265 with pneumatics from day 1, but as we've learned there are always alternative models and probably a final two, and for whatever reasons and parties involved, Model B won out for production. MK is required to be happy about it, but I think if up to him our hopes would not have been fulfilled then so tragically annihilated. I hope they did not make the gear transmission if the LA's extremely slow like they did with 8295. They did that on purpose so everyone would buy the PF motorset. For 8295 it can be easily fixed by switching the two gears directly next to the LA. In 8265 I see a lot of 16 gears. The 8265 is a very nice model and it looks brilliant. I really like the differencial gears and other new parts to. I just really DON'T like the LA's. I suppose I could build my own studless version with pneumatics and an air tank. I could give it four wheel drive and a hand pump that is supplimentend by a motor pump driven by the wheels. I think i'll add pneumatically actuated articulated steering, a v6 or an inline four engine and use three sets of two pneumatics end on end to control the bucket (which I don't like either but the preasent pneumatics just aren't anywhere near long enough! meh!). With that in mind i'll probably just do that. problem solved! 8^). Despite pneumatics parts, not being used in TECHNIC sets for some seasons, I still believe in Designers words, when they stated LAs were not intended to replace pneumatic cylinders, but for complementary applications. PF pneumatic switch would be sweeeeeeet! I do hope LA's are only complimentary (and not a replacement) to pneumatics. One gripe I have with them is that they are used in many places where pneumatics would have been much better. Imajine trying to actuate the shovel of last years excavator with a third LA with a drive shaft from the main body. Although I like lots of complexity thats just messy. Much better to run a couple of hoses like in real life. That being said I really DO like the use of them in the 8258. But thats the only exception so far. I'm also glad to hear Conchas say they're not dead. BTW I don't think iv'e ever said how great I think this site is! Thank you very much for this place. Combined with all the latest product news we have a specialised place to discuss Technic and for Lego to listen (which I really think they do!) Thank you. The articulated steering you intend to implement using pneumatics is an example of an application where LA's are better. With pneumatics, you have practically no control of the degree of steering: only full left and full right, most importantly with no straight position. An example of pneumatics being better is the one you described, the end of the shovel arm on the Backhoe. As for TLG heeding TBs, I wouldn't be very surprised if they did. Even if not, Fernando, as a LAmb (to distinguish from "[L]inear [A]ctuator ;)) has the opportunity to convey thoughts and ideas directly to TLG. It would take a little skill to control the steering I grant you. And if there is no pressure you would have no steering at all. Hmmmm. I suppose in that case LA's could be better but it would take lots and lots and lots of cranking on the HoG wheel to turn even if it was geared up. Can you imagine the thrill of getting a new Pneumatic set? The more time it takes the more excited we all will be! Maybe here TLC is intended to surprise us, AFOL community. May Kjeld hear you, Ricardo! I think its 4WD because I see a large Differential sized DkStone gear at the back between the wheels.